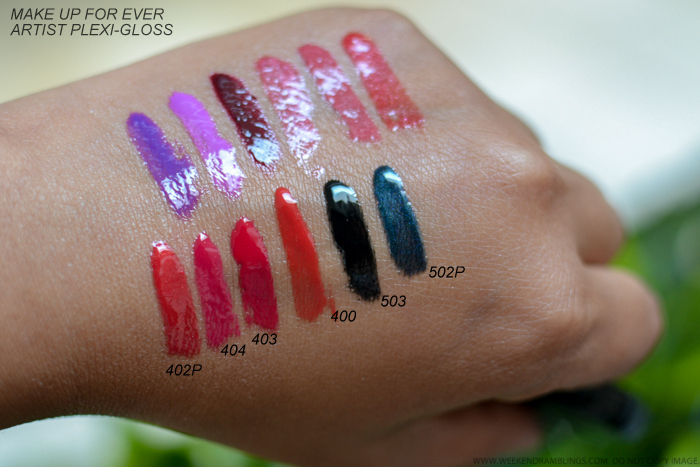 Make Up For Ever Artist Plexi-Glosses are available in a ton of colors, from bright reds to even an opaque black and of course a whole lot of neutral, wearable colors. The gloss applicator is a bit different from the usual lipgloss wands in that it has a small slit/split in it to hold a tiny reservoir of gloss and sweep on the ideal amount on to the lips. 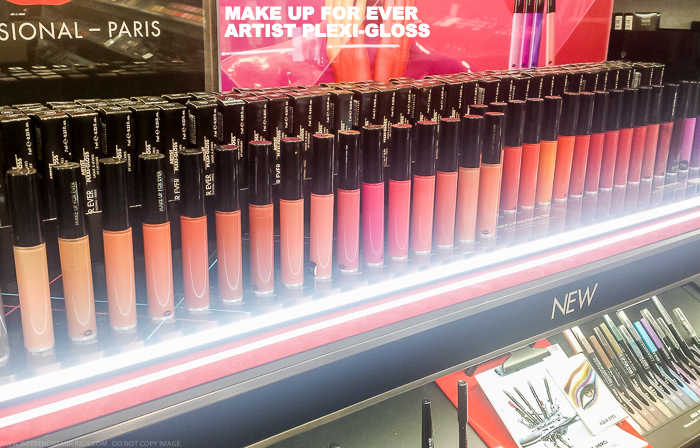 I am not sure how these glosses would look when applied with the applicator included in the actual full-size gloss. I tend to use a lip brush most times, so it probably wouldn't be an issue for me. 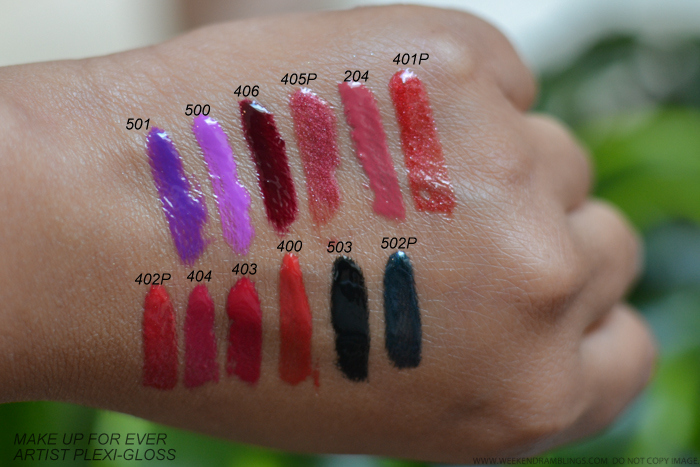 Anywho, here's a look at the swatches of the MUFE Artist Plexi-Gloss range. 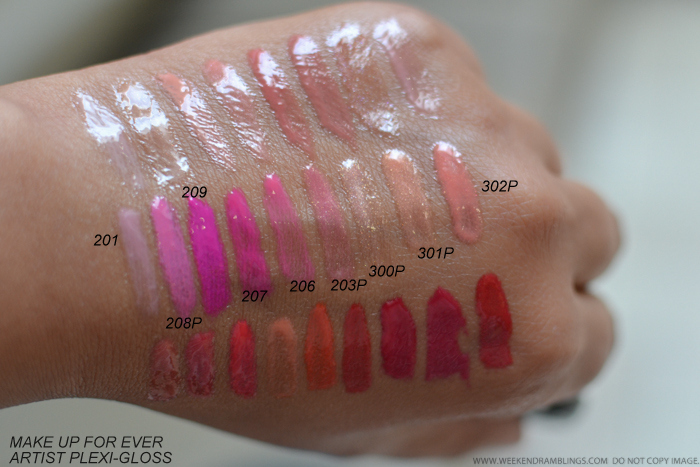 From what I have tried, the MUFE Artist Plexi-Gloss lipglosses are long-lasting and quite moisturizing. 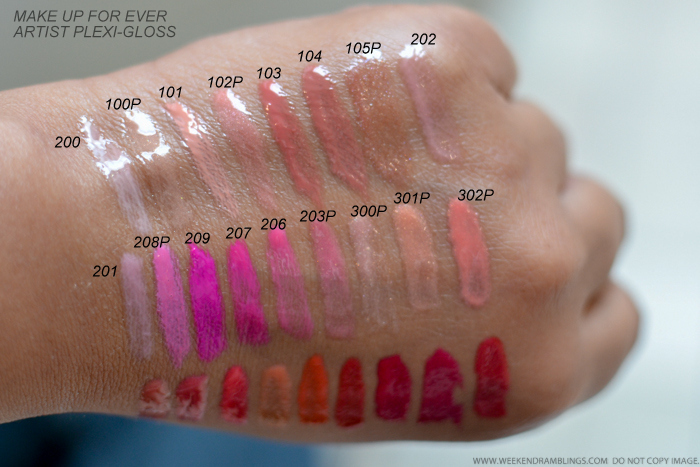 The glosses are tenacious and while they do transfer, the color stays on the lips for a long time. My favorite among the shades in the tiny Sephora sampler is the shade 304 - a bright reddish coral that I am definitely going to pick up a full size of. The formula seems to make bright colors like these a lot easier to wear. The 2 paler colors in the sampler don't look too good on me when used on their own. I do have unevenly pigmented darker lips, though, and I am sure they would look good on someone with less pigmented lips and/or if used over a lipstick or a lipliner (which is how I am planning to use them). 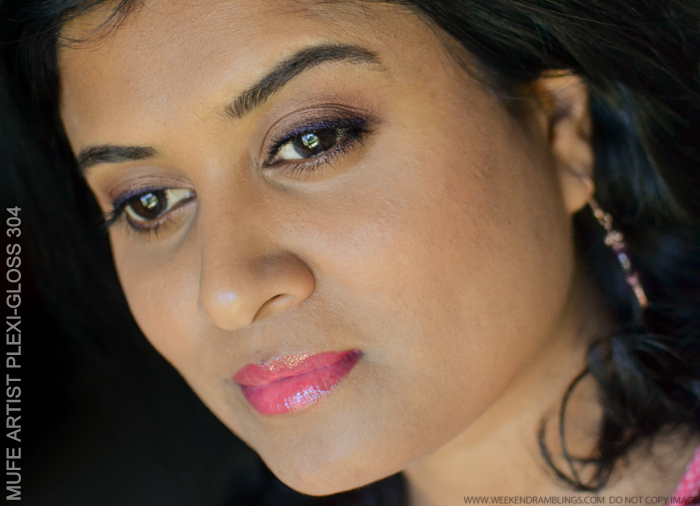 Here's how the two colors - MUFE Artist Plexi-Gloss 202 and 100P - look on my lips. 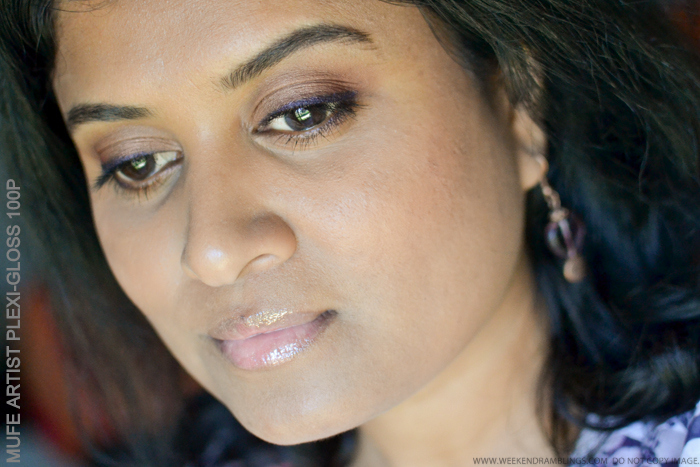 Wearing MUFE Artist Plexi-Gloss in 100P. This shade has fine shimmer in it that is not visible in the photos but does show up under brighter lighting. It's not chunky or glittery though and is quite subtle. Wearing Make Up For Ever Artist Pexi-Gloss in 202. I have applied this lipgloss on its own, without any liner or concealer to help cover my lip pigmentation. For a pale, soft color, this does provide some coverage, though not sufficient for my lips. 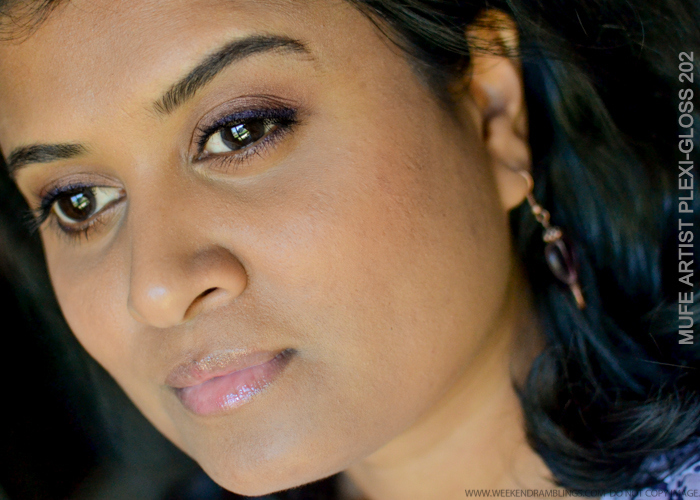 I actually like to use this color (as well as 100P in the pic above) over a lipliner or a lipstick. 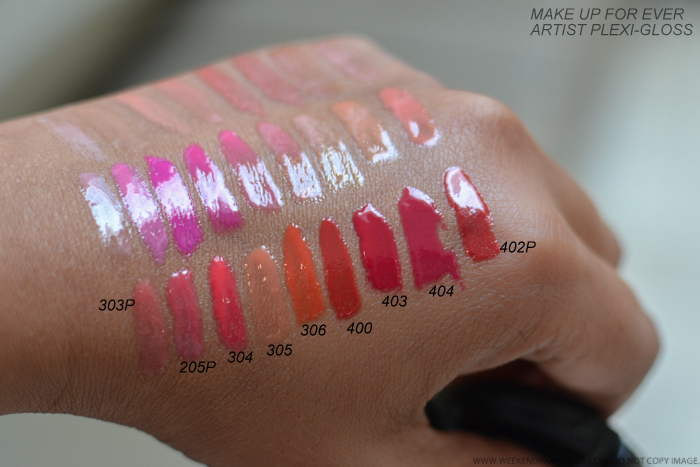 Overall, I absolutely love the MUFE Artist Plexi-Gloss range. True to claims, the colors last a good 5-6 hours on my lips, with the reddish coral 304 leaving a tint on my lips at the end of the day. There was no bleeding/feathering around the lip edges even for the more pigmented colors. I am planning to pick up a few of these colors - 304 is already my go-to color this summer.